The first picture reveals the coupe-inspired silhouette that gave the original S60 its unique stance. It has now been further accentuated. "The concept car's design gives a visual promise of enthusiastic driving characteristics and I can assure you that the new S60 will deliver a sporty drive like no Volvo before," says Odell. "The inspiration comes from the Swedish coastline's cliffs and seas," explains Volvo Cars' design director, Steve Mattin. 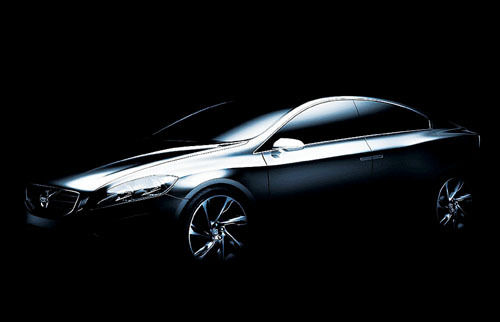 "The concept car's exterior gives a clear indication of what customers can expect of the all-new S60. On the inside we've been even more daring – there the focus has been on creating a vision of the future." "In a concept car the aim is to give your imagination a free rein and our iconic super-slim centre stack was the perfect object. Using pure crystal is a thrilling experiment. We may well see interior features in crystal-like materials in the future," says Mattin.